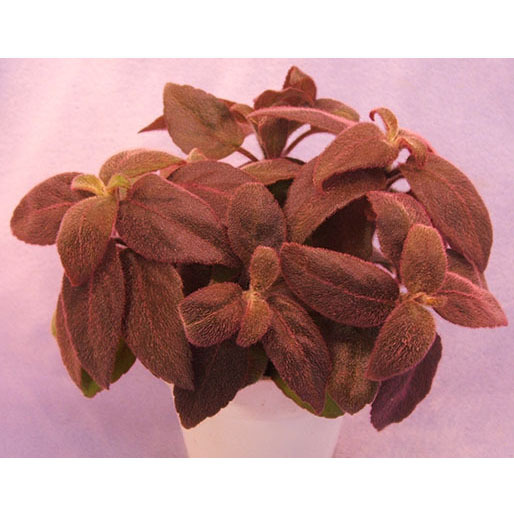 A species that can be grown smaller with soft, fuzzy, khaki green and brown leaves with darker stems and backing. White blooms with yellow throat, hint of purple, if allowed to grow larger. Nice plant to use as accent in plantings because of small size, texture, and color of leaves. I really lie this little plant! It's fuzzy leaves and interesting color make it a nice contrast to other Gesneriads. It shapes up well and although I've never gotten it to bloom, I'd grow it anyway. I really enjoy this plant. It spreads nicely and fills a pot easily. The color is different and really striking. I haven't gotten it to bloom but it is worth growing for just its leaves. I'd give this a five star rating.